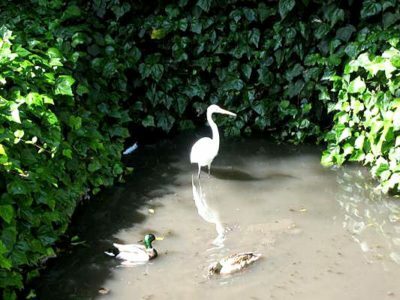 EGRET AND DUCKS from last year’s tour of Brookside’s waterway. View seven gardens along the Brookside stream on Sun., April 26 from 1 to 4 p.m.
Open to the public, the event is sponsored by the Windsor Square-Hancock Park Historical Society. Several houses will also be open, said co-chairmen Patricia Rye and Sandy Boeck. The tour begins at 8th St. and Longwood Ave., and follows the stream to 949 Longwood Ave. where refreshments will be served. The natural waterway, called Rio del Jardin de las Flores, plays host to crawfish, frogs, minnows, raccoons, koi and migratory birds. After surfacing in Brookside, the stream continues underground and empties in Ballona Creek. Cost is $30 for members, $35 for non-members, or $50 including membership. The tour begins at Longwood Ave. and Eighth St.